This past weekend I was perusing the seafood at the commissary-sometimes they have great seafood, but not always. 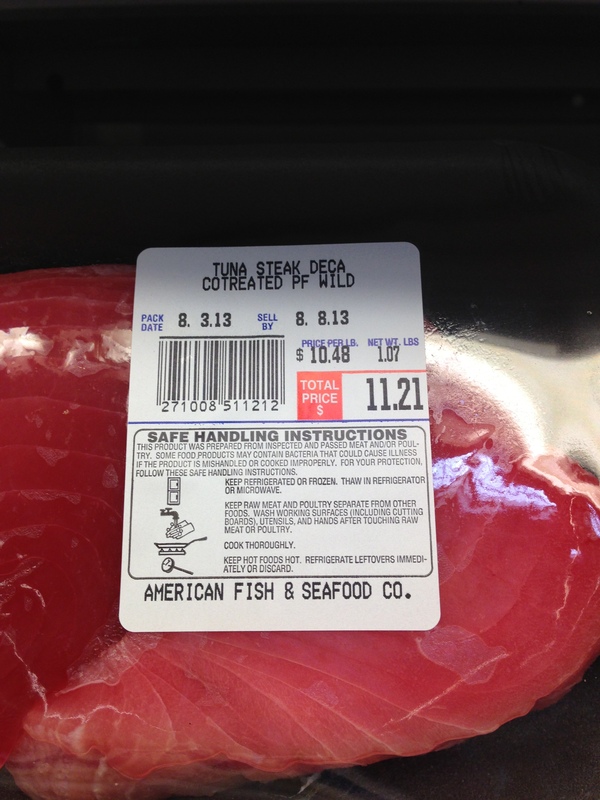 I saw there was some great looking ahi, so I approached it and grabbed it to take a look. I noticed the words “cotreated pf wild.” My first thought was probably not as “wild” if it’s treated? I have never heard this, so I asked the seafood guys who were making their delivery right then, they had no idea, said they’d never heard of it before either (amazing just how out of touch we are with food in this country). I know longer buy food unless I know what it is, what’s in it, where it came from and if I’m comfortable with it (I try my best anyway). So, I put the cotreated seafood back and did what I usually do, started googling in the aisle to investigate further. After reading, I passed on the ahi. I need to do more research because I honestly don’t know what the labeling requirements are for cotreated seafood in the US. I did read that it’s banned in Japan, Europe and Canada-shocker. Apparently it’s a fairly common practice to gas brown seafood with carbon monoxide to make it look lively again. Joy!